The suspension roof of this 1.45 million-sq.ft. (134,850-square-meter) convention center integrates the contextual, environmental, structural, and programmatic requirements of the project into a single sweeping gesture. 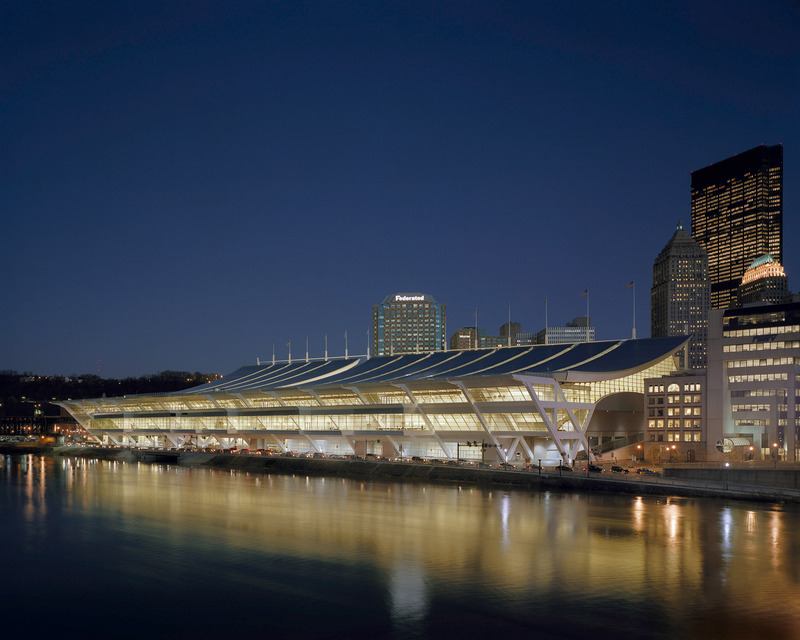 Its iconic design takes inspiration from the historic suspension bridges that span the Allegheny River adjacent to the riverfront site, and provides the latest chapter in Pittsburgh’s long history of engineering and technological innovations. This unique steel cable structure made possible a naturally lit and column-free 250,000-sq.ft. (23,236-square-meter) exhibition hall. Extending downtown Pittsburgh’s civic realm above and through the building, the new center provides both a public roof terrace with panoramic views of downtown and the Allegheny River.